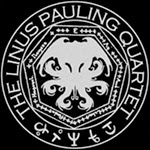 Dj Astro's: The Linus Pauling Quartet: C Is fir Cthulhu 7"
I've been a fan of this heavy US psych / stoner rock band for years now and they always deliver. This is a cool new 7" single for all fans of heavy and psychedelic music and the horror literature of H. P. Lovecraft and I just happen to be both! The 7" comes in a cool black and silver cover that you can open up to read all the info and lyrics. You will also find a sticker, download card and a playing card in the package (I got a black four or hearts...). On the A side there is the new groovy, mid-tempo and heavy master piece "C Is for Cthulhu" and I honestly think it's one of the best pieces that the band has ever written. The main guitar riff is very addictive and the chorus quite catchy (and sort of ghoul-like) as well. There's also a nice guitar solo and some hooks to keep you interested. Follow me into madness! Excellent. Just check out the video... The track also features some organ and synthesizer in the background. For the B side they have recorded a track by The Pain Teens from Houston and their singer Carl Sandin does the angst-ridden vocals with a merciless triple-guitar attack going on. This is a fierce, heavy and hypnotic wall-of-sound song and I love it too! The vinyl is suitably in blood-red... One of my favorite singles released in 2014. Get a copy while you can!